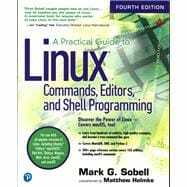 Mark G. Sobell has forty years of experience working with UNIX and Linux systems and is the author of many best-selling books, including A Practical Guide to Fedora™ and Red Hat® Enterprise Linux®, Seventh Edition, and A Practical Guide to Ubuntu Linux®, Fourth Edition. Matthew Helmke got his first computer in 1981, a TRS-80 Color Computer. He started using UNIX in 1987 while studying LISP. He works as a technical writer and has written about Linux and other topics for magazines and a diverse set of companies. He is the author of several books, including Ubuntu Unleashed, The Official Ubuntu Book, and VMware Cookbook.